Mup has always taken her Aunty’s rules for granted (don’t go into the forest, don’t talk about your grandmother). After all, she lives a safe, comfortable life with her parents and little brother Tipper. But then her Aunty passes away and the raggedy witches appear and Mup’s dad disappears. Suddenly nothing is safe or comfortable, and Mup and her family must be courageous and strong if they’re going to get their dad back. 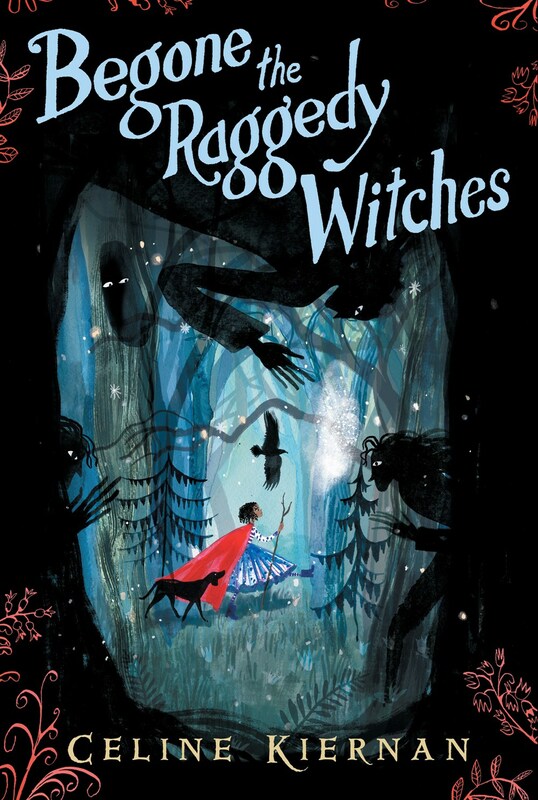 Begone the Raggedy Witches (Candlewick, 2018) is written by Celine Kiernan, an Irish author. Although it’s not mentioned specifically, I believe the story is mostly set in Ireland. As far as I know, the story is not based on a specific folktale, but it does feel infused with deep folk beliefs and images (a bit like Tiffany Aching). Likewise, Kiernan trusts her readers to follow her into another world without specifically calling it fairyland. I liked this approach a lot; it allows the story to stand independently while also giving the imagery a feeling of depth and meaning. I also found it kind of a fresh take on a portal fantasy. Mostly, I really loved Mup and her determination. When she knows she’s going into the realm of the raggedy witches, she dresses in her brightest, shiniest clothes in a little bit of defiance. And this moment is a nice example of the courage she shows throughout the story. But she also cares deeply about her family and the people she meets, especially those who have no one else to care about them. I got the sense that she really wants to understand people and why they approach the world the way they do. The character-building here is fantastic and since I am almost always a character-driven reader, I really appreciated this. There is a lot of complexity in Begone the Raggedy Witches, between the fraught history between Mup’s mother and her Aunty and the political and social tensions in Witches’ Borough. And Kiernan doesn’t water this down for kids at all. There’s a lot of thought about what it means to be complicit in someone else’s horrible actions and what it happens when you take away someone else’s choices even out of good intentions. But it’s also a hopeful book, with an emphasis on renewal and regeneration. I don’t want to spoil it for anyone, but there are some lovely scenes about the return of magic that worked really well for me. Scary books seem to be popular with kids right now, and this one would be great to recommend to a kid who doesn’t truly want to be scared but doesn’t mind something a little bit creepy. The raggedy witches are pretty terrifying at first, and the evil Queen of Witches’ Borough (who also happens to be Mup’s grandmother) is spine-chilling. The consequences are pretty real and not everything is happily resolved by the end. But it would be perfect for the reader who’s comfortable with a mature look at power in a fantasy world, with some funny moments and an overall empowering feel. Finally, I really loved Kiernan’s prose in this book. There’s a crisp vividness to the descriptions and everything stays grounded in Mup’s perspective which helps the reader discover the world as she does. It’s poetic in maybe my favorite sense: not necessarily flowery but with a turn of phrase that illuminates and makes everything strange and beautiful. This was just a lovely read, from the gorgeous cover through to the ending. This sounds like something my kids would both love to read! The cover is entrancing as well! Sounds like a really well-written, imaginative read. I hadn’t heard of this one, so thanks for sharing.